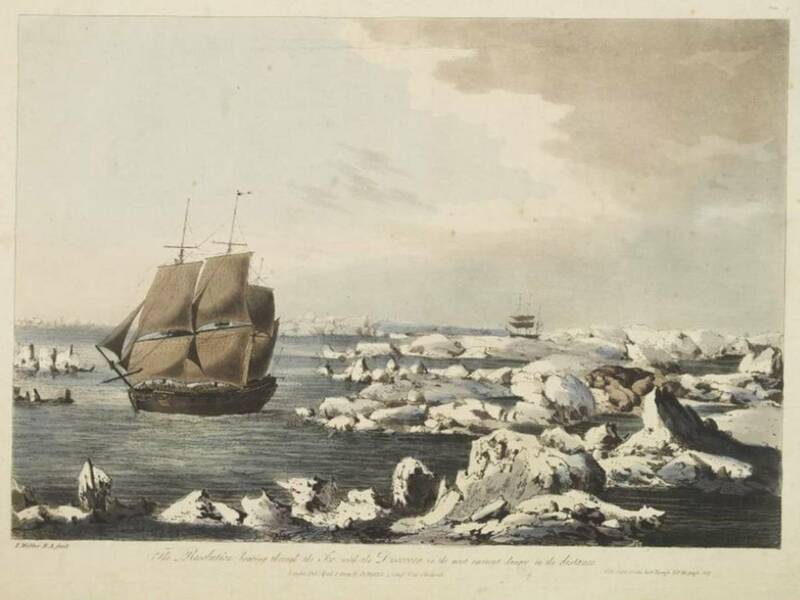 “The Resolution beating through the Ice, with the Discovery in the most eminent danger in the distance” on 18 August 1778 off Icy Cape, Alaska – Cook’s farthest north. Etching by John Webber, published 1792. On 11 August 1778, Captain James Cook, the preeminent navigator of his age, sailed north through Bering Strait into the Arctic Ocean in search of the Northwest Passage. A week later his progress was halted by “ice which was as compact as a Wall and seemed to be ten or twelve feet high at least” [from Cook’s journal]. Retreating southward, he wrote, “Our situation was now more and more critical, we were in shoald water upon a lee shore and the main body of the ice in sight to windward driving down upon us. It was evident, if we remained much longer between it and the land it would force us ashore” [see figure]. Cook and his ships escaped this “most eminent danger” but ultimately did not find the Northwest Passage. A new book by the University of Washington Press (Arctic Ambitions: Captain Cook and the Northwest Passage) (http://www.washington.edu/uwpress/search/books/BARCOO.html) is a collection of 18 essays chronicling Cook’s exploration of the Northwest coast of North America and his brief foray into the Arctic on his third (and final) voyage of discovery. The Polar Science Center’s Harry Stern contributed the essay called Sea Ice in the Western Portal of the Northwest Passage from 1778 to the Twenty-First Century, which opens with the paragraph above, and considers whether Cook would have discovered the Northwest Passage if sea-ice conditions in 1778 had been similar to those of today. (Yes, he would have, but Arctic navigation is still treacherous). A museum exhibition about Arctic Ambitions will open at the Anchorage Museum at the end of March (https://www.anchoragemuseum.org/exhibits/arctic-ambitions-captain-cook-and-the-northwest-passage/) and will come to the Washington State History Museum in Tacoma in 2016. Stay tuned for further details later in 2015.